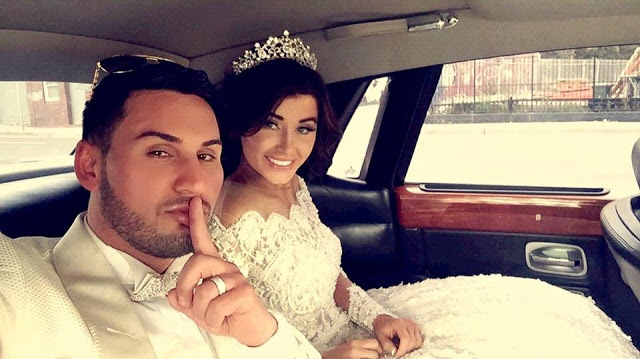 Controversial former Auburn councillor Salim Mehajer is now not allowed to be within 50 metres of his wife Aysha, after he was slapped with an Apprehended Violence Order (AVO) following a confrontation at her sister's Wollongong home. The AVO is in place for the next five weeks. Neither Mehajer nor his wife, whose maiden name is Learmonth (the name on the application) were present for the proceedings in the Downing Centre Local Court on Wednesday. The order is in place until 17 August, which means the couple will not be together on their first anniversary 15 August), which was the date of the wedding they dubbed the 'wedding of the century'. This follows on from confirmation from him on Tuesday - according to this report in The Daily Telegraph - that his wife was no longer living in their Lidcombe mansion, still claiming that they see each other 'every day'. Police filed the AVO application against Mr Mehajer on behalf of his wife after she told police he kept 'popping up wherever she is' and feared he could become violent, a police source said. The property developer's lawyer, Matt Ward, told the court that his client did not oppose three points in the AVO, including that 'the defendant must not assault, molest, harass, or threaten' his wife. He has also been ordered not to intimidate or stalk her. 'The defendant must not go within 50 metres of the premises at which his wife resides or works' and that Mr Mehajer 'must not approach or contact his wife' except through the defendant's legal representative. But he won't have any opportunity to change that ruling until the middle of next month, at the earliest. This follows on from an earlier report - several months ago - in which 'A Current Affair' suggested that the much talked about politician had split from his wife, Aysha. See the couple's wedding day video HERE. And the much talked about pre wedding day video and photos HERE.